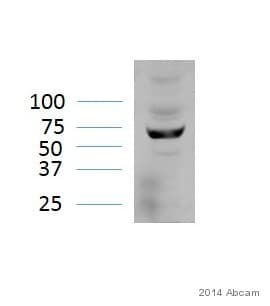 Recombinant human IRF-5 (176-240 aa, isoform D) purified from E. coli. NCBI Accession No. : NP_001092099 (formally NP_002191). WB: Extracts of Ramos, THP-1 and A20 cells. ICC/IF: THP-1, Raw264.7 and HEK293. FC: THP-1 cells. Our Abpromise guarantee covers the use of ab33478 in the following tested applications. WB Use at an assay dependent concentration. Detects a band of approximately 58 kDa (predicted molecular weight: 58 kDa). Lanes 1 - 2: Merged signal (red and green). Green - ab33478 observed at 56 kDa. Red - loading control, ab181602, observed at 37 kDa. ab33478 was shown to specifically react with IRF5 in wild-type HAP1 cells as signal was lost in IRF5 knockout cells. Wild-type and IRF5 knockout samples were subjected to SDS-PAGE. Ab33478 and ab181602 (Rabbit anti-GAPDH loading control) were incubated overnight at 4°C at 1/500 dilution and 1/20000 dilution respectively. Blots were developed with Goat anti-Mouse IgG H&L (IRDye® 800CW) preabsorbed ab216772 and Goat anti-Rabbit IgG H&L (IRDye® 680RD) preabsorbed ab216777 secondary antibodies at 1/20000 dilution for 1 hour at room temperature before imaging. Flow cytometry analysis of IRF5 in THP-1 cell line, staining at 2-5µg for 1x106 cells (red line). The secondary antibody used goat anti-mouse IgG Alexa fluor 488 conjugate. Isotype control antibody was mouse IgG (black line). Immunocytochemistry/ Immunofluorescence analysis of IRF5 in Raw264.7 cells. The cell was stained with ab33478 (1:100). The secondary antibody (green) was used Alexa Fluor 488. DAPI was stained the cell nucleus (blue). Immunocytochemistry/ Immunofluorescence analysis of IRF5 in THP-1 cells. The cell was stained with ab33478 (1:100). 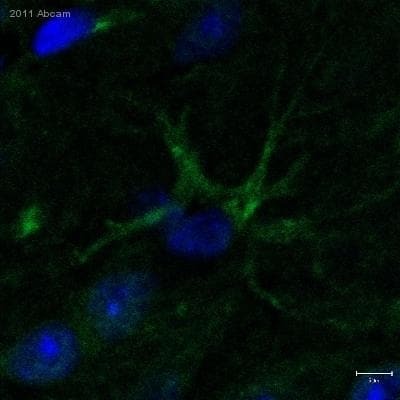 The secondary antibody (green) was used Alexa Fluor 488. DAPI was stained the cell nucleus (blue). Immunofluorescence/Immunocytochemistry analysis of HEK293 cells (105-106) stained with Mouse monoclonal [10T1] to IRF5 (ab33478 1/100-1/200). Additional bands at: 26 kDa, 80 kDa. We are unsure as to the identity of these extra bands. 100-200µg of whole cell lysates were used for western blotting. Overlay histogram showing THP1 cells stained with ab33478 (red line). The cells were fixed with 4% paraformaldehyde (10 min) and then permeabilized with 0.1% PBS-Tween for 20 min. The cells were then incubated in 1x PBS / 10% normal goat serum / 0.3M glycine to block non-specific protein-protein interactions. The cells were then incubated with the antibody (ab33478, 1µg/1x106 cells) for 30 min at 22ºC. The secondary antibody used was DyLight® 488 goat anti-mouse IgG (H+L) (ab96879) at 1/500 dilution for 30 min at 22ºC. Isotype control antibody (black line) was mouse IgG1 [ICIGG1] (ab91353, 2µg/1x106 cells ) used under the same conditions. Acquisition of >5,000 events was performed. This antibody gave a positive signal in THP1 cells fixed with 80% methanol (5 min)/permeabilized in 0.1% PBS-Tween used under the same conditions.